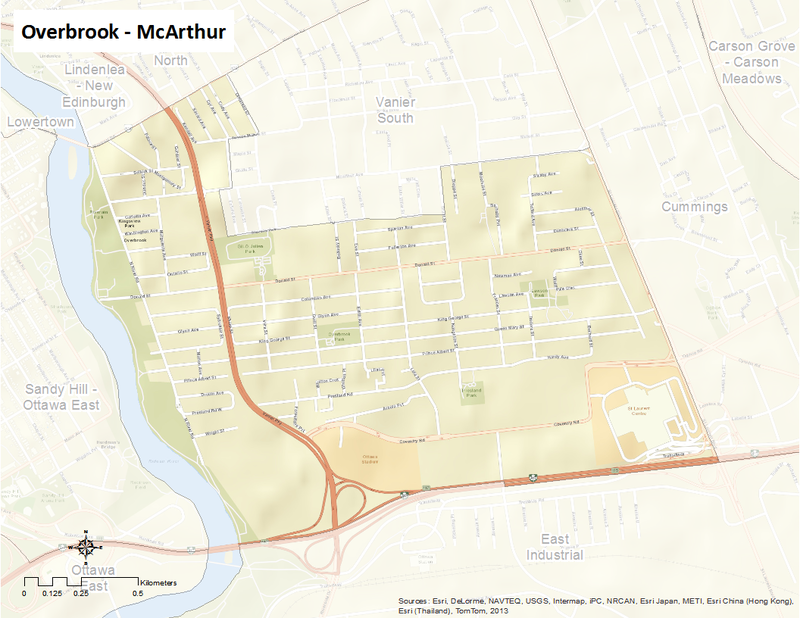 Overbrook – McArthur is bounded on the north by Montreal Road, and a number of other roads including McArthur road. To the south lies Highway 417, St. Laurent Boulevard is to the east, and the Rideau River lies to the west. The neighbourhood includes the communities of Overbrook, Hurdmans Bridge, Castle Heights, and Donald Court. The Duke of Cornwall and the Duchess of York visited Ottawa in 1901. Ten years later, upon the death of King Edward VII, the Duke and Duchess acceded to the throne as King George V and Queen Mary. Within a year, the first reference to Overbrook is found on a map published by Thorburn & Abbott. The community of Overbrook had two streets named after the newly crowned King and Queen commemorating their coronation, and a third street commemorating the consort of Queen Victoria, Prince Albert.